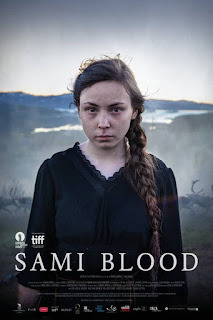 SAMI BLOOD opened in New York next Friday, June 2 at the Landmark Sunshine Cinema. The film has won countless awards so far including Best Debut Director at the 2016 Venice Film Festival and was featured in almost every top festival including TIFF, Venice, Berlin, Sundance, Toyko and many more. This drama is about a 14-year-old Scandinavian girl belonging to the Sami people. It deals with prejudice in the 1930s . When Elle-Marja played by Lene Cecilia Sparrok is forced to strip for a photographer in a room full of people I felt all the embarrassment that any young girl could feel in this situation. My heart broke for her as showed her strength and humiliation at the same time. Such an amazing actress.